Belmont and Heathfield Flats are located on the main University of Dundee campus, with everything you need to study within easy reach. There is no deposit payable for students at Belmont and Heathfield Flats. These buildings are regulated according to Scottish Housing (HMO) legislation which ensures a high safety and management standard. As part of this, the flats are regularly inspected by the local authority and the Scottish Fire and Rescue Service. Residence Fees are payable according to the University payment guide. Once the initial rental payment has been made students can either pay via a full online payment, bank transfer, or by instalments of 8 monthly direct debits. For international students the University of Dundee have partnered with Western Union so that students can securely send international wire transfers in their local currency. Single rooms are brilliant value and are fully furnished with a single bed and en-suite bathroom. Queen rooms are brilliant value and are fully furnished with a Queen (3/4 size) bed and en-suite bathroom. Perfectly located on the main University of Dundee campus! Your very own private bathroom so you can sing in the shower as much as like! Belmont and Heathfield Flats are excellently located for University of Dundee students as you will be living directly on the main campus, whilst also being within walking distance of the city centre. Heathfield Flats (Single rooms) – 75 Old Hawkhill, Dundee, DD1 5EN which is made up of 71 6 person flats. Belmont Flats (Queen rooms) – 76 Old Hawkhill, Dundee, DD1 4HE which is made up of 12 5 person flats (premier rooms), two 2 person flats and 46 6 person flats. Belmont Tower (Single rooms)- Mount Pleasant, Dundee DD1 4HD which is made up of one 4 person flat, two 6 person flats, two 7 person flats and ten 8 person flats. The flats come with a bathroom and fully fitted kitchen with dining area. In some of the flats this will also include a soft seating area. All bedrooms have en-suite facilities. With this accommodation being directly on campus you will have the added benefits of being adjacent to the University sports hall, tennis courts, swimming pool, Main Library and students association. In addition, the all inclusive bills cover contents insurance, maintenance, security and Wi-Fi, offering you peace of mind in your new home. 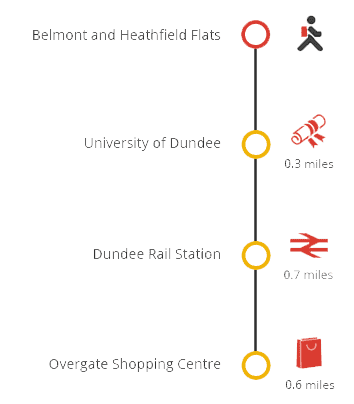 Belmont and Heathfield are located in an ideal location for students at the University of Dundee. The residences are right in the heart of the campus and only a few minutes walk from all of the main campus teaching buildings. Being on campus, residents will be able to make the most of everything the University has to offer. This includes the sports centre, Students Union, swimming pool, tennis courts, library and a mini-supermarket. If that's not enough we are also located in the fashionable West End, right on the edge of the city centre. We have two theatres and a range of pubs, clubs and restaurants right on our doorstep. 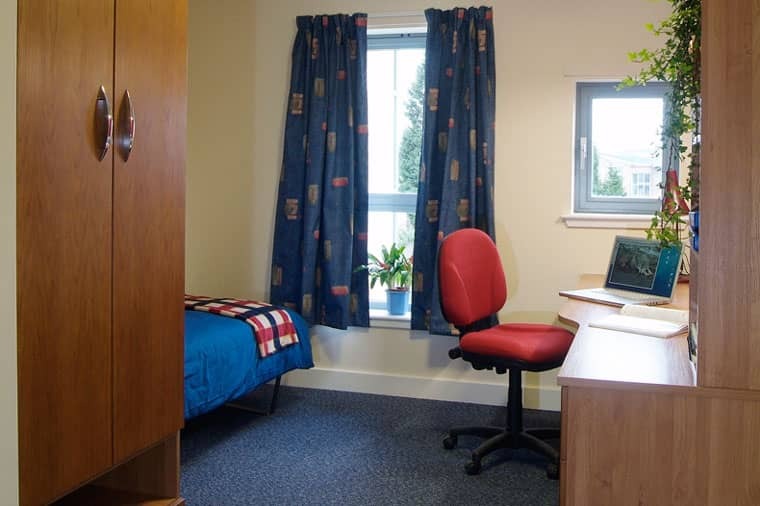 Our accommodation is typically available for new starting undergraduate and postgraduate students. Once the student has accepted their place with Dundee University information on how to apply is sent via email from the University Admissions and Student Recruitment Department. For further details about the booking process, please see the University of Dundee website. The University provides a Wi-Fi service in all bedrooms and kitchen/lounges and there are also network connections in all bedrooms. These services provide full internet and email access plus access to all of the campus computing services, subject of course, to the University's acceptable use policy. The moving day information for Belmont Flats can be found on the University of Dundee website. Your agreement with the University is for the full period and if you choose to move out before the end of the tenancy, or if your occupancy is terminated as a result of a breach of discipline, you will still be responsible for paying your rent up until the end of your tenancy. However, if a replacement University of Dundee student can be found by you and is approved by the University, they may take over the tenancy. You will need to pay your rent until the replacement tenant has moved in. A full contract will be available to download from the University website once you accept your agreement. The University of Dundee has arranged contents insurance for you with Endsleigh; at no extra cost. For more information and to check your policy details, please refer to the University's Insurance document (PDF 121KB). On-site parking on the University campus is not available for students unless they have a disability and hold a blue badge. In addition, there is no parking available to guests and visitors.